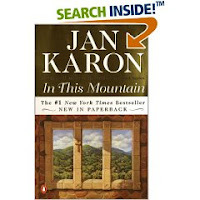 A year after I first began the Mitford series, I have to say that I'm not particularly fond of Karon's writing style. I can't put my finger on it (maybe you can) but it doesn't seem top notch. I say that as a non-writer who has poor grammar herself at times! I know that Karon is using "backwoods" speech to express and describe her characters so most of it is forgivable but it does seem a stretch now and again. Nevertheless, I still enjoyed the story. I love Mitford. It may be light reading but I like it. I can imagine it into reality (so I hope they don't ever try to make a movie out of it) and it becomes a part of me when I need to kick back and relax. I need a porch of my own to sit on at night and just.....relax! I didn't realize that the series was still going, I might have to pick up the last couple of books. Thanks for your thoughts, they were enjoyable as always! I have only read the first two books in the series, and that was quite a while ago. My mother is a big fan and has read most of them. I do remember the books being very comforting--something gentle and pleasant for the mind. Someday I'll get around to reading the rest of the series. Yes, Mitford is nice place to relax. I don't know waht to call these books. They're not deeply philosophical and profound, but there is something there, something real and encouraging.